The official war diary of the Matron-in-Chief, British Expeditionary Force, is held at The National Archives under the references WO95/3988, 3989, 3990 and 3991. It comprises around 3,400 pages, and fills, to the top, four archive boxes. The first entry is written by Maud McCarthy on Wednesday, 12th August 1914, the day she reported to No.2 General Hospital at Aldershot, to prepare for embarkation for France, and the last on March 31st 1920. McCarthy wrote each page herself, in longhand, from the first day until the 31st August 1916. From 1st September 1916, the diary was typed by her office staff from her notes, either written or dictated, and other than short leave, and a period of absence between March and August 1917, when she underwent two operations for appendicitis, the diary was ‘hers’ until the day before she finally returned to England on August 5th, 1919. In addition to noting the general day to day comings and goings and official business of the nursing services, she also wrote long passages, describing her frequent visits of inspection to every hospital and casualty clearing station within her jurisdiction It is a unique record of the conditions under which the nurses lived and worked, the effects of the ebb and flow of the war on the medical services, and it provides excellent insight into the lives of both the trained nurse and the volunteer. It logs the early days of the war; the rapid increase in the number of medical units and nursing staff; the desperate fight to find enough nurses to supply the ever growing number of hospitals; the rapid process of demobilisation, and finally the stabilisation of the nursing service within the Army of Occupation in Germany. Although my original intention was to edit and publish in traditional form, the immense size of the document – almost one million words – meant that so much would have been left out, that both the factual content and the flow would have been destroyed. Publishing on the Internet will make this valuable source available to all, and new content will appear at regular intervals until complete. During the Great War, all military units were required to complete a day to day account for the whole period that they were engaged on active service, and there are 5,500 of these war diaries held at The National Archives in class WO95. They vary enormously in content; most are written by a succession of junior officers, often giving a very brief overview of daily life, punctuated by longer accounts of battles and casualties; a few have pages of high literary quality; the work, perhaps, of men who were academics or teachers in civilian life, but the majority tend towards the more mundane ‘Weather cold; shelling remains heavy’ type of entry. The official war diary of the Matron-in-Chief with the British Expeditionary Force in France and Flanders, however, has proved to be a remarkable document, and very different from most others. It might be noticed from this biography, that by the time she entered the London Hospital in 1891, she had ‘lost’ four years from her age, and this discrepancy was carried forward on her application to QAIMNS in 1902, her sister Mabel signing a declaration that she was born in 1863. The fact that McCarthy was four years older than generally believed, makes her service during the Great War all the more remarkable. 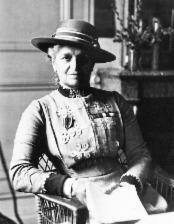 The diary shows her as having seemingly limitless energy and endurance for any woman, let alone one who was 55 years old when she went to France, and sixty by the time she returned in 1919, the only head of a department within the British Army to retain her post throughout the Great War. The diary covers more than five and a half years, starting with scribbled entries a few lines long in 1914, and evolving into long, typed passages in later years, one day often stretching over three or four pages. To provide consistency throughout the transcription, I have standardised some of the punctuation and formatting of the text, which in the original varies wildly, sometimes different versions of the same abbreviations occurring within a single sentence. Words obviously mis-spelt have been corrected, but spellings acceptable at that time, but which have now fallen out of use have been left as in the original, e.g. shewing, tressles. Some words are abbreviated to several different forms in the original have been standardised. Punctuation has been added to, or changed if necessary, to clarify the meaning of a sentence. Paragraph breaks may have been added, or altered, again to add clarity, but the actual text remains unchanged. Some words, paragraphs or pages have been omitted, mainly on account of illegibliity - these will be marked where they occur. The spelling of proper names and places has been a particular problem. I know from other records that many are incorrectly spelt in the original, and even if correct, surnames are often preceded by incorrect initials. If you are searching a page to find a proper name, I can only advise you to use the name alone, without initials, and to be inventive! If the word is unclear, but I feel I can make a good stab at it, it will appear in pink. This is an edited transcription, and I have added, omitted, or changed some words if necessary to aid clarity and understanding. From July 1917, due to the massive increase in content some text has been removed from the diary. This is restricted to notes of arrivals, departures, resignations and leave, and the intention is to leave a briefer but interesting document - it might be the wrong decision, and comments welcomed! All abbreviations used in the text are explained on a separate page, accessible from the main, left-hand margin. I would like to emphasise that this is a sympathetically edited transcription; for complete accuracy please refer to the original document. I am directed to inform you that you have been appointed Principal Matron, Lines of Communication, Expeditionary Force, and to request that you will report yourself to the Officer in Charge, No.2 General Hospital, Aldershot, not later than 4 p.m. today, Wednesday. I am to add that you will be at the disposal of the Deputy Director of Medical Services, Lines of Communication, as above.